After executing your test suite you probably want to show off some numbers to your team or boss and say “Hey look, all our 391829 tests passed!”, don’t you? If you are using TestNG’s default reporting class, your reports won’t look as impressive as Daniel Dyer‘s ReportNG library for TestNG. Neat and simple, isn’t it? TestNG (NG stands for Next Generation) is a Java testing framework written by Cédric Beust. To learn more about it, just head over to the official website, the user community at Google Groups or watch Cédric’s presentation at GTAC (Google Test Automation Conference) 2007. If you are reading this blog, you are probably interested in running end-to-end functional tests with Selenium. TestNG is perfect for that task, because unlike other testing frameworks, it’s very flexible and easy to use, and still very powerful. If you need to run your tests in a specific order, you can either define test dependencies between methods/groups or set TestNG to run your methods in the same order you have specified. Everything can be done via annotations or through a XML file. Considering this scenario, the first thing that comes to mind is creating a long test case that goes through all the steps. This might be a good approach if you are writing a manual test case. However, since we are writing an automated test, we want to write our script as modular as possible to be able to reuse parts of it in future scenarios. Keep in mind that this is just an example. You are free to model your tests in any way you want, as long as they have business value and will validate your business logic. These are the test methods (or steps) we are going to use. Notice that all of them have a @Test annotation. That’s how TestNG finds out which methods should be invoked by the test runner. If you forget to add the annotation, TestNG will not execute the method. If you are familiar with unit testing frameworks, you probably know about the setup and teardown methods. TestNG goes beyond that idea and allows you to define methods that will be run after or before your test suites, test groups or test methods. PS: Did you notice those weird parameters? They are stored in the XML file (we are going to see in the next section) and accessed by a ITestContext object, which was injected. Now, to define the order of the tests, we will have to create a XML file listing the test methods we would like to run. Make sure that the test methods are annotated with @Test, or else the TestNG engine will not invoke them. Before TestNG 5.13.1, you had to use Method Interceptors if you wanted to run the tests in the order defined in the XML file. I have posted my implementation of a Method Interceptor on my Github account. From TestNG 5.13.1+, you can just add the “preserve-order” parameter to your test tag and include the methods you would like to run, reducing unecessary code in your test suite. We finished writing our tests, now how can we run them? You can launch TestNG from the command line, using a Eclipse plugin or even programatically. We are going to use the Eclipse plugin. Follow the steps described on the official TestNG documentation over here. There is no point in duplicating this information. If you really want to think about the future of your test suite, I would recommend you to read Adam Goucher’s article published on PragPub this month. He talks about Selenium 2 and the Page Objects Model (a very nice way to model your tests, especially if you use Selenium 2). Since there are lots of people still using Selenium 1, I’ll stick to that for a while, but Selenium 2 will eventually be covered here. Anyway, as the number of tests in your test suite grows, you will find that grouping them in different test classes is a good idea. If you do that, you can take advantage of object oriented programming and create a new class named BaseTest (for example), and leave your configuration logic there. That way, every test class must extend the BaseTest class and use static attributes. 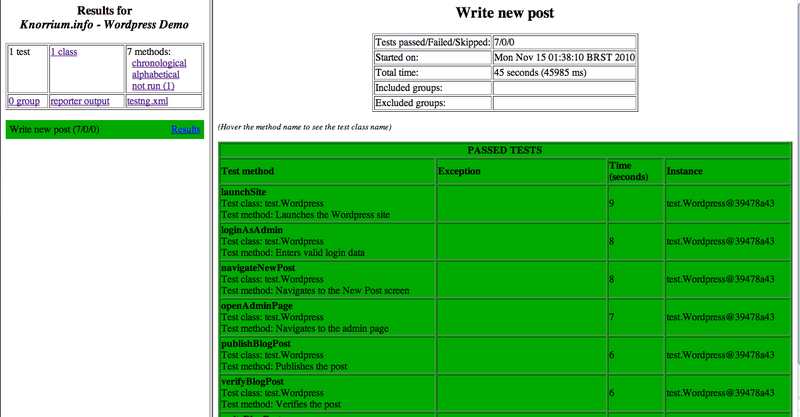 It does look better than leaving your configuration methods in the test class, doesn’t it? TestNG provides very powerful configuration methods and flexibility to let you do pretty much whatever you want with your tests. The goal of this post was to introduce you to TestNG and some basic concepts, just to spark your interest. The next posts will cover more advanced features like method groups, listeners (for reports and taking screenshots) and data providers (for data driven testing). Stay tuned. In the next few days the code used in this post will be up at my Github account. I’ll update this post and also tweet about it. PS: I’m having some problems with the comments system, everything is being flagged as spam. If you want to discuss about TestNG, feel free to join the TestNG-users group, linked way up above. My first year at Yahoo! Firebug and XPath: two new ingredients to the mix. Carlos Gasparetto on My first year at Yahoo! Marcelo Trein on My first year at Yahoo!